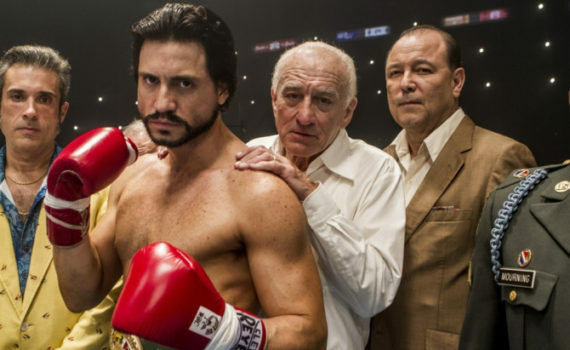 It’s not easy to screw up the American boxing movie genre, but Hands of Stone finds a way, knocking itself out in a lone bout that should have been a walk in the park. The subject of the film isn’t American, perhaps that’s the first mistake; right or wrong, we like our sports heroes to be homegrown, like Rudy or Rocky. And, it’s interesting, their families can be Irish or Italian, but we want them to feel like good ol’ American boys. Bleed for This, Southpaw, The Fighter, Creed, Cinderella Man; there’s a formula that starts with a hard-nosed fighter and ends with a thrilling victory, a path that should be difficult to veer away from. But Hands of Stone strays off, finding itself in the bumpy berm, and fails to live up to the established standard. This is the true story of the rise of one of the greatest boxers of all-time, Roberto Duran. Born poor in Panama and raised on the streets, this scrappy kid turned his anger into money and food by fighting for a living, channeling rage against his squalor and his father into knockouts in the ring. Quickly becoming one of the best young pugilists in the world, his career would take off when he hired famed manager Ray Arcel to take him to the next level. Ray was from New York, was once a big name in the game, but had run afoul of the mob, forcing him into an early retirement. But he would come out in order to teach a spirited and talented youngster who he could see had the potential to rise to unbelievable heights. The setup seems typical enough to slide into the genre; poor kid, tough life, fights with purpose, hits road bumps, overcomes odds. And of course it’s true, this happened, Duran was larger than life, and the film captures the history of the matches and the legend of this man quite well. That’s probably the highlight, the attempt at accuracy, as well as the acting of the leading lady, Ana de Armas, who was great, but that might be where the positives end. The rest of the movie is a bore, an angst-ridden slog through the life of a volatile man, or at least that’s the way he’s painted, although perhaps he only had one or two hiccups, it’s hard to tell with the timeline spread out and the bad moments spotlighted. Ramirez plays a bit of a caricature, De Niro is uninspired, and the whole movie drags as, for some reason, Usher is ushered in, and then out, as if his performance was something that we needed to see. It wasn’t, and this film isn’t, unfortunately.